Did you recently decide that it’s time to upgrade your entertainment system? Then you already know you’re going to want the best 4K TV on the market. But there’s one small problem. Finding the best UHD TV in the UK is no easy task. It doesn’t help that companies fill the spec sheets with convoluted terms and jargon. Thankfully, we’re here to save the day! We listed all the important specs and details to help you find the right 4K TV. So, are you ready to find the best 4K TV in the UK without falling for any of the manufacturers’ marketing tricks? Then read along with us as we teach you all you need to know! First things first. Do you really need a 4K TV? For the short answer, the picture quality on a 4K TV is far more clear and detailed than on a typical HD TV. If you’re wondering how this occurs, the better picture mostly results from a higher pixel count. A typical 1080p HD TV offers 1,920 pixels left to right and 1,080 pixels in the vertical range. If you do the math here, you’ll get a number just over 2 million. Here’s how a 4K TV holds up. These UHD TVs up the ante by offering 4 x the amount of pixels as the typical 1080p TV. To be exact, you get 8.2 million pixels with a resolution of 3840 x 2160. To better clarify here, note that four pixels on a UHD 4K display will fit inside a single pixel from an HD 1080p picture. This not only means that a 4K TV will pick up much more detail and clarity than a 1080p TV but also that you can view the 4K TV much closer before the image becomes pixelated. For this reason, the 4K TV is your go-to option when shopping for larger screens. So you thought we were done with the 4K spec? Keep in mind that picture quality depends on many more factors than the pixel count. So, here are some options to keep in mind when trying the find the best 4K TV for you. When shopping for a 4K TV, you’ll want at least a 10-bit panel. This panel determines the range of colours the picture can display. 8-Bit panels are a feature of older TVs. Thus, you won’t see near the quality or vibrant pops as you would on a 10-bit panel. These panels even come in 12-bit, which displays even more colour. But, for most people (and budgets), a 10-bit panel is just fine. Plus, with a 10-bit, you can count on your 4K TV’s picture remaining relevant and future-proofed for years to come. In simple terms, this number determines how good a picture looks when motion appears on display. The true logic behind this is that the measurement tells you how many times a picture refreshes within a second. You will find this number measured in Hertz (Hz). Typically, 60 Hz is the standard rate. But TVs with 120Hz (or more) are not uncommon. As a general rule of thumb, higher Hz measures usually display movement without distracting blurs and chops in the picture. As a word of caution, be wary of words such as “effective refresh rate.” Really, this means the manufacturer doubled the refresh rate on the box. So, an effective refresh rate of 120Hz is really 60Hz. For the best picture, we advise buying TVs with refresh rates of at least 120Hz. If you’re a gamer, you won’t want to skip this spec. TVs with low input lags portray an image from the game console (or video player) on the the TV screen faster. When looking at the screen, the difference might not be noticeable. But, when playing a game, you might notice some lag between the time you push a button on the controller and when something occurs on screen. So, to avoid this issue, try to find the lowest input lag possible. As the name implies, this refers to the angles at which the picture retains full quality. You might notice on many TVs that the more you move to the side of the display, the more the picture loses quality, colour accuracy, contrast, and brightness. This is an important spec to consider when arranging furniture and seating around your TV. While you can always check this spec in the stores, be aware that many retailers will set the screens to unnaturally high brightness and colour levels. This boosts the viewing angle for a store environment, but not necessarily for your home. If you’ve ever been interested in photography, this term will already sound familiar. As the name implies, this spec allows a picture to display more detail in the shadows and highlights of a scene. For the most part, you’ll also receive a larger colour palette as well, with deeper blacks and more vibrant whites. When checking the HDR specs, you will find a few different formats. These aren’t simply marketing jargon, as you will notice some noticeable differences between all formats. This is the format you will find most frequent on 4K TVs from major manufacturers (Sony, LG, Samsung, etc.). This is also the standard setting for most devices, such as 4K UHD Blu-ray disks, Sony PlayStation 4, and Xbox One S.
Keep in mind that, when compared to Dolby Vision, some video specs will be lower. For the most part, these displays cannot reach as high of brightness levels as Dolby Vision. Also, HDR10 typically only supports 10-bit colour displays while Dolby Vision will support 12-bit panels. So, you might not notice as strong of a colour spectrum with HDR 10. As we mentioned above, Dolby Vision outshines HDR in terms of display quality. Here, you will find stronger brightness and colour gamut levels than other displays found on the market. But, even with this said, Dolby Vision still comes with a few issues. Manufacturers must pay licensing fees, so they still aren’t super frequent in the market. So, despite receiving a great picture, you’ll also need to scope out the few devices that can support Dolby Vision should you choose to go this route. This is a format BBC and NHK developed to provide HDR formats for live video broadcasts. This is still a relatively new format, so few devices and TVs have come to support it as of yet. However, HLG offers backward compatibility with Standard Dynamic Range for those times you find devices that do not yet support HLG. Currently, video services such as YouTube and Freeview Play support HLG. Here is a format from Amazon Video and Samsung. Just as the name implies, HDR10+ takes everything great about HDR10 and updates it. This technology allows a display to more accurately change brightness levels depending on the scene. This is also royalty-free, which means we can expect services and devices to support this format soon. Later in 2017, Amazon Video will support the HDR 10+ format. Functionally, this feature will produce more realistic colours on your display. This occurs through WCG increasing the palette of the TV. So, you see deeper reds, greens, blues, and other colours. This allows those colours that previously looked too deep or dull to now appear more realistic and detailed on a 4K display. WCG also increases a displays bit depth. In other words, you see more shades in between colours, which again, creates a more vivid picture. In total, WCG offers more than one billion colours–which is incredible for a modern display. Note that not all 4K TVs, or even HDR displays for that matter, support WCG. Thus, you’ll need to check the specs to see if the TV is capable of displaying WCG quality images. This spec refers to the TV’s backlighting technology. In simple terms, this is a set of LED lights spread across a grid behind the TV’s LCD screen. Most TVs will only place the LED lights on the edges of the screen. These LED lights will separate into different zones that dim to create deeper blacks. If you’re interested in QLED TVs, this is the main spec for you. These TVs employ the technology of nano-crystals placed behind the TV panel. One of the benefits here is that the TV receives a massive colour palette. Also, these crystals alter the light of each colour before passing them through colour filters. This allows for a more vibrant picture. Lastly, these dots will allow for one of the brightest pictures you will ever see. So if you want brightness and colour, check for quantum dots. These TVs contain light-emitting diodes. 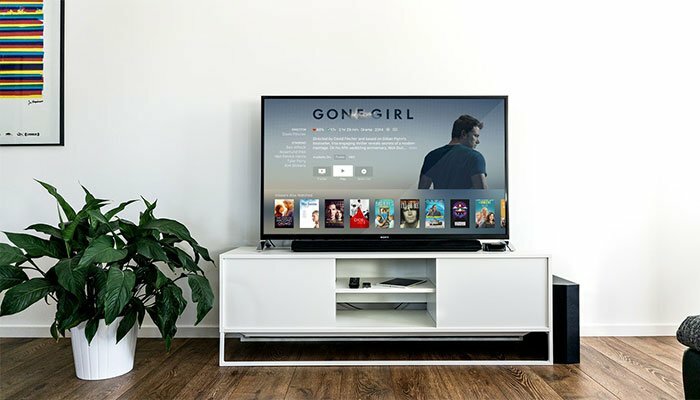 Because these TVs do not require backlighting, they will generally be thinner and lighter than other types of TVs you will find on the market. Usually, these TVs will offer wide viewing angles—often upwards of 160 degrees. So, if you plan to place your 4K TV in a wide, open room, an OLED is a great choice. Keep in mind that OLED displays usually have the best contrast ratios on the market as well—typically 1.000.000:1. With this number, you’ll see shades of black as deep as possible on a modern 4K TV. Lastly, these displays present some of the most vivid pictures you will ever find on a TV. Sadly, these will deal quite the hit to your wallet, as they tend to be pretty expensive. In today’s market, Smart TVs are almost standard. And this is not a bad thing. Overall, Smart TVs allow your 4K TV to run a variety of music and video streaming apps, such as Netflix and Amazon Instant Video. Most will even come with social media apps and web browsers to stay updated with all the latest information. Even if your TV lacks smart functions, you can always buy a cheap Amazon Fire stick or Roku stick to receive similar apps on your 4K TV. Unless you plan to buy a universal remote, this will be another spec to consider. In today’s market, remotes come in all shapes and sizes. Some will even offer Netflix buttons for quick access to the app. Some companies like Samsung prefer a minimalistic approach with roughly seven buttons. Other remotes will bring some great utility features as well, such as pointers, voice control, gesture pads, and touchpads. The size of your screen might not sound like such a big deal. But note that most consumers will list their biggest regret as not purchasing a TV with a larger screen size. So with this in mind, you too might appreciate an adequately sized screen. For most living rooms, we’d recommend TVs of 55-inches or larger. Of course, you can always take measurements and determine which size will look best. Furthermore, if you already own an entertainment system, the rule of thumb is to leave at least an inch of space on the top and sides of the TV for space. Alternatively, you always could buy a new entertainment system altogether to accommodate for a larger display. Or, even cheaper, invest in a wall mount bracket to fit a large 4K TV in your home. In the past, the ports and slots on a TV were a pretty big deal. Today, times have changed quite a bit, as you’ll realistically only need HDMI slots. Simply count the devices you will want to connect to your 4K TV and ensure the device presents enough HDMI slots. But there’s still a little bit more you’ll want to note here. In order to support the newest and best video content, you’ll want to ensure the TV comes with an HDMI 2.0 slot. This will support that tight 60-frames-per-second quality found in video games and sports broadcasts that you will definitely want to see in 4K-quality. 4K HDR support even requires HDMI 2.0a – the newest HDMI update. Of course, you will see other forms of connectivity as well. Most video game consoles allow for HD connection through component cables—this will free some HDMI slots if you need. Most TVs will also come with USB and SD card slots to display pictures as well. For older devices, you will want to check for analogue ports. For the most part, you won’t notice much of a difference between the two in terms of picture quality. When watching a curved TV, you might feel a more immersive experience–similar to how you feel when watching a TV at a cinema. But, for the most part, you won’t see much of a difference when it comes to deciding which produces a clearer, more vibrant image. At the end of the day, curved TVs make more of a cosmetic statement. And this is not necessarily a bad thing–they do appear quite sleek and stylish. It’s probably a surprise to no one that warranties are great to have. They ensure you won’t be spending unnecessary amounts of money to replace faulty parts and displays. Most TVs will come with a 1-5-year guarantee or warranty. In all honesty, this is all the time you’ll realistically need. Most problems with a TV will surface within your first 1-3 months of owning it. So, with this in mind, you likely won’t want to waste any money paying for an extended warranty – very few buyers ever actually use them. Overall, finding the best 4K TV does not need to be such a difficult task. All you really need to do is read the above specs and decide which ones matter most to you. Furthermore, after reading our guide, we hope you better understand some of these specs manufacturers like to list on the boxes of their products. So now that you’re a pro in understanding these TV terms, you’re now ready to buy the best 4K TV for you!